(Reuters) - NASA Administrator Jim Bridenstine has a vision for renewed and "sustainable" human exploration of the moon, and he cites the existence of water on the lunar surface as a key to chances for success. "We know that there's hundreds of billions of tons of water ice on the surface of the moon," Bridenstine said in a Reuters TV interview in Washington on Tuesday, a day after NASA unveiled its analysis of data collected from lunar orbit by a spacecraft from India. 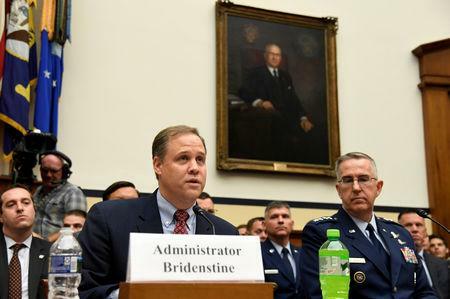 Bridenstine, a former U.S. Navy fighter pilot and Oklahoma congressman tapped by President Donald Trump in April as NASA chief, spoke about "hundreds of billions of tons" of water ice that he said were now known to be available on the lunar surface. Bridenstine spoke to Reuters about making the next generation of lunar exploration a "sustainable enterprise," using rockets and other space vehicles that could be used again and again. Trump last December announced a goal of sending American astronauts back to the moon, with the ultimate goal of establishing "a foundation for an eventual mission to Mars." Water, yeah, but what about moonshine? Hope it's not Flint Michigan water!